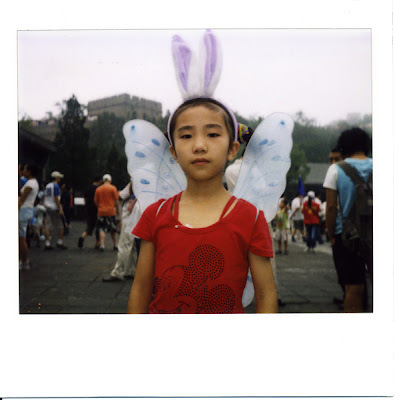 Taking the Polaroid camera to China was genius. Taking so little film was foolish. I didn’t realize that I would not be able to buy Polaroid film there. At first, I would take two photos keeping one and giving away the other, but too soon my film supply ran short. People were wonderful about letting me take their pictures. I would dance a pantomime with my camera, pointing and smiling like an idiot, and most often, once subjects, people would smooth their clothing and pat their, then stand formally and handsomely while I framed the shot. The “whirr” and “kerplunk” of the camera as it spits the picture out the front seemed always to catch them by surprise. Often, they looked disappointed at the blank image, and I would try to make up some sign language that indicated they must wait and see. Then a crowd would begin to form and the image would pass from hand to hand. Someone, usually an older person, would begin to wave the photo in the old Polaroid manner and it was impossible for me to tell them it would not help. Once the image began to develop, the fun began as I tried to get the photograph back, chasing it from hand to hand through the crowd. All the while, others would offer themselves up for the camera. I was a shaman with a magic box. Funny, I thought, as they all carried digital cameras with them. It was not the instant image, then, that created the excitement, but something else. There is a magic in Polaroids that has not diminished, it seems.